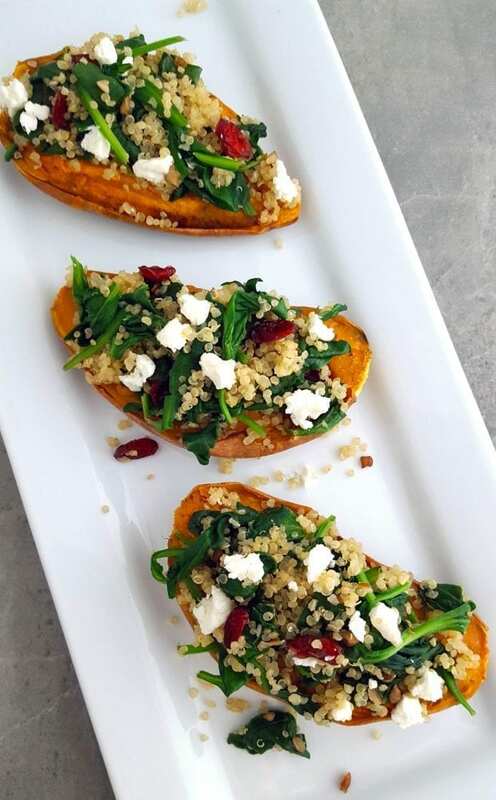 This Quinoa & Spinach Stuffed Sweet Potatoes recipe is a great healthy side dish or lunch time meal option. We finally got our first snow day of the year. Well, I live in the south, so it was more like ice mixed with a tiny bit of snow. We had played for about an hour before it looked like rain coming off the trees and roof. It was also Kylo's first time seeing snow (because we didn't get any last year) and he was fun to watch run around the yard. The break was much needed for everyone in the family. I took on more classes last semester, so I was always busy with school and work. It took away time from my family to tensions were high. I was able to relax and enjoy my family over the holiday, and I was so thankful for that. Now I need to get back into the swing of things and get healthy again because I gained all the weight I had lost back from all the junk food I ate over the holidays. I bought my husband a FitBit for Christmas and I wasn't sure he would even use it, and he even told me he might return it but since he put it on he as been a fitness nut! He is constantly trying to get those final steps in every hour, and it makes me want to get one now. My weakness is eating better, though. I have the worst time meal planning lunches for myself when I'm working from home. Dishes like this one are a great option for lunches or a side dish during dinner. The flavors are fantastic also. You can also store the leftovers for the following day. 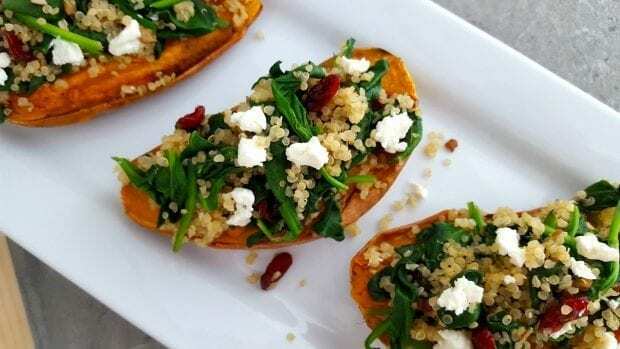 These Quinoa & Spinach Stuffed Sweet Potatoes are filling and a great way to boost your day. There is a great mix of salty, sweet, crunch and softness all in this one dish! I hope you have a wonderful 2017 and are able to keep all your New Year's Resolutions. I haven't sat down to write mine out yet because I'm not sure what I'd like to focus on. I'm also still on my own break so I'll work on it when the chaos starts again. Until then, I'm taking a quiet bath. Cut clean sweet potatoes evenly in half lengthwise and place face down on a baking sheet. Brush on a light layer of olive oil and sprinkle salt and pepper on the skins. Roast for approximately 30 minutes or until they are tender. 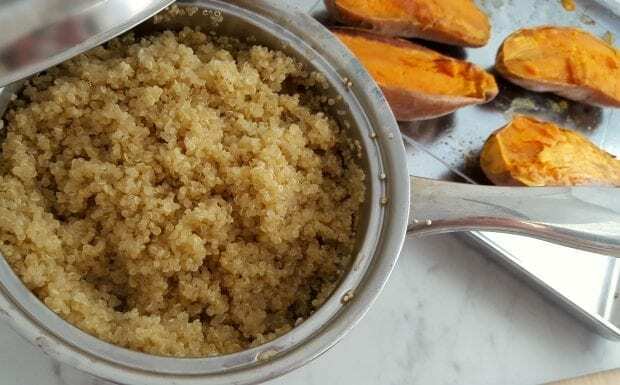 While sweet potatoes are roasting, rinse quinoa under running water and set aside. Bring chicken stock to a boil in a small saucepan. Pour quinoa into the saucepan with the stock and stir. Bring the chicken stock down to a simmer, and allow the quinoa to cook for approximately 15 minutes. It is done when it looks like it has popped and there is no excess liquid. After quinoa is cooked – place olive oil in a large sauté pan over medium heat. Add garlic and chopped spinach and cook until spinach is wilted (approximately 3-4 minutes). 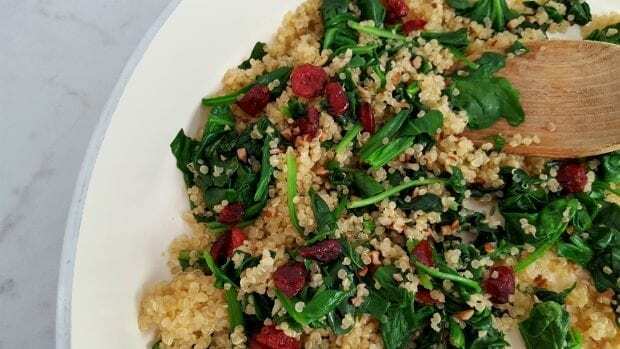 Remove from heat, and stir in cooked quinoa, pecans, cranberries and salt and pepper to taste. After the sweet potatoes have roasted, use a spoon to press down the center so it is more open for the filling. 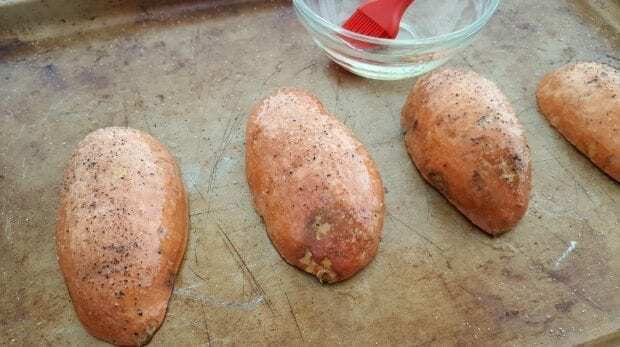 Spoon the filling into each sweet potato evenly. 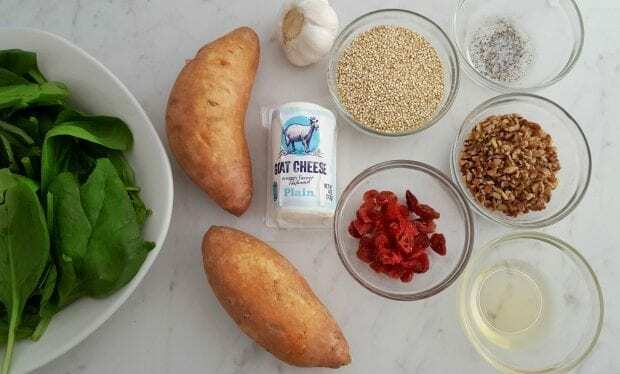 Add crumbled goat cheese to each and serve. These make a very flavorful and healthy side dish for baked chicken or fish. Refrigerate any leftovers – they are excellent the next day. Yummm. 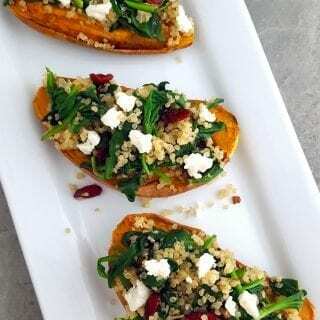 I love sweet potatoes and the addition of the ancient grains makes the texture even better!